You are here: Abbeyrose Foundation / News & Announcements / May 2014 Tip – Keep Medications Out of Reach! May 2014 Tip – Keep Medications Out of Reach! Accidental ingestion of human medications is the number one cause of pet poisoning. The most common medications ingested are heart and blood pressure medicines, but other medications, including over the counter drugs and prescription pet medications are also a risk. Always keep medications out of the reach of your pet, following the same precautions you would if there were a child in the house. 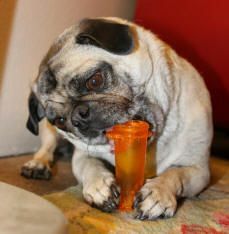 Your dog can break open a child-proof container in no time and can scoop up dropped medications faster than you can react. Store medications out of your pet’s reach and place purses containing medications in a safe location. Don’t leave medications on the seat of your car or on a low table where you dog can get them. Don’t walk around with loose medications in you hand or with an open (or closed) bottle of medication. When taking medications, do so behind a closed door or over a counter or sink so that your pet will not have access to accidentally drop drugs. Remind house guests to be careful too!